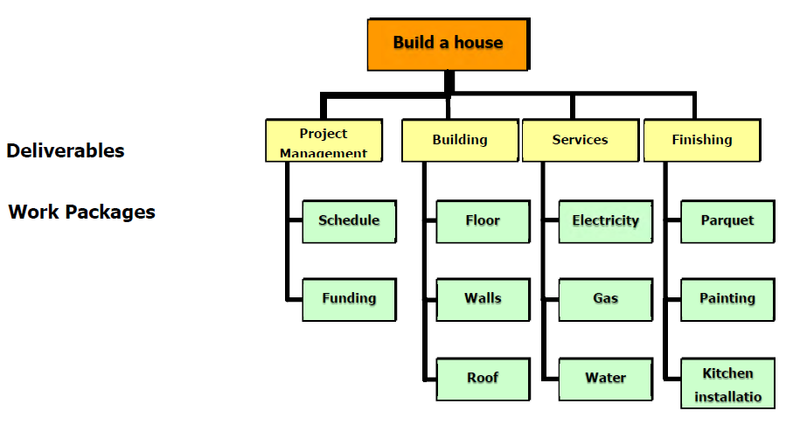 A Work Breakdown Structure (WBS) is one of the key factors for the success of the project. This is a chart that breaks down the work to be done (a "what" Breakdown Structure) project. At the top, the name of the project comes to you. Then on the second level (yellow in our diagram), insert the top of the project deliverable. Make sure you always have the "Project Management" as your first deliverable. The reason is that there are lots of activities and work packages related to project management, and not just the result of the project itself. For the third and subsequent levels, the question is: "What should I do to reach the highest level / subject?" The important thing to remember is that at the end of this training, you will have all the work packages and the packages needed to work the project results. You may find that a single work package in the WBS for a Project Manager is a full project to another project manager.